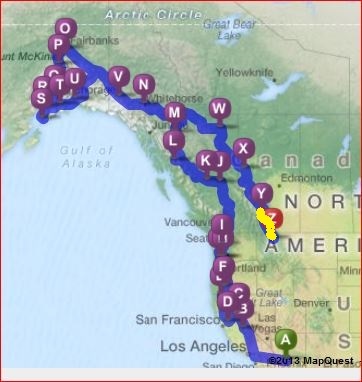 For the new reader, our family recently returned from a lifetime adventure driving all the way from Arizona to Alaska…and back. You can read our daily trip diary if you scroll back to the beginning of June. For all you regular followers, I don’t know about you, but I’m having withdrawals not writing every day.My mind still has things to share but generally the chore list has taken priority. Today’s writing is a large compilation of things we learned from our trip. 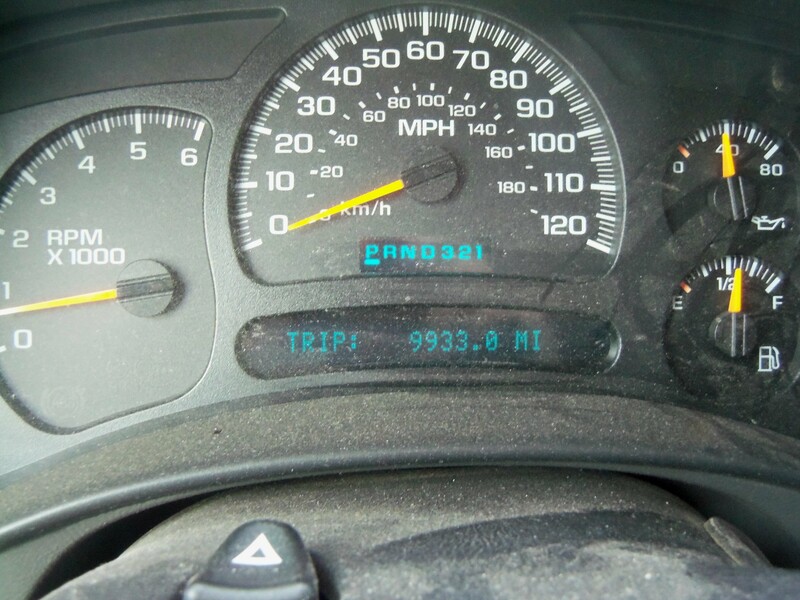 At 9,933 miles we put on about 2,000 more than originally calculated. Since we didn’t drive in circles we must have underestimated our detours, particularly through the parks. What’s the Boy Scout motto? 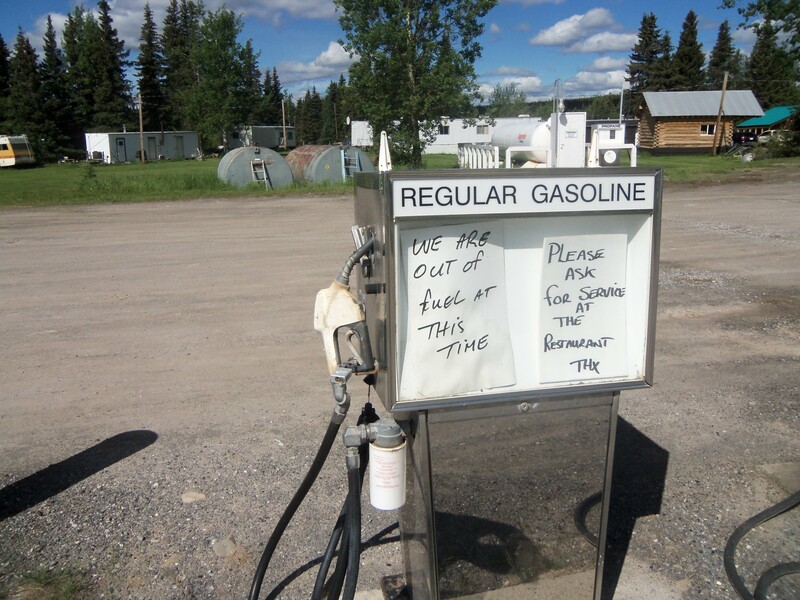 We did not have a problem finding gas but… Bob was nervous about it enough to always fill the tank before it got below half full and we paid great attention to the signs about distance between stations. We did see some gas pumps out of gas. We also found that ‘gas station’ is not exactly what we know in the city; many had one or two pumps and most were the old fashioned kind where you had to pay inside, requiring the store be open to get fuel. Not all stations were open in the evening. We learned that there are two types of tents and ours was the one for mild weather. The wind and rain both blew right in. Reason one to stay in a hotel. We also learned that while there are RV places all along the highway, not all will take tenters and often those who will do not have bathroom facilities close to the tent areas. The National Park and Provincial Park campgrounds are very standard with toilets and access to fresh water at a cost less than $25 per night for a tent. Camera in hand. Foot ready for the gas. Groceries and supplies are expensive outside the big cities but there are Walmarts and chain grocery stores at regular intervals through Canada and into Alaska. With all our dietary restrictions we packed most food so only needed to buy fresh produce and meat (and even then we used cans of chicken/tuna, etc.) All the stores had an assortment of ‘non-dairy’ milk which surprised me. We had no trouble finding our almond milk. Three weeks plus the weekends, from Seattle to Salt Lake, was just barely enough time to do everything but not enough time to spend with everyone. This is a hard trip to do without being retired. It would be much easier without a set schedule. We learned to have our camera ready at all times because the local animals are not afraid to travel alongside the road. It was exciting to capture the grizzlies, blacks, moose, caribou and deer who just happened to be crossing just as we came along. Never have we been so close to so much wildlife. If you, or someone in your family, qualifies for one of the Access Passes offered by the park system take the time to fill out all the paperwork for it. Matthew’s pass allowed us to get into all the parks free and we got half off on campground fees in the US. The rangers don’t like cheaters and requested his ID at most of the entrance stations. Still even if you don’t get a pass take time to visit the parks making sure if you travel during holiday weeks you reserve your spot. Teddy Roosevelt had real foresight when he began the national park program. 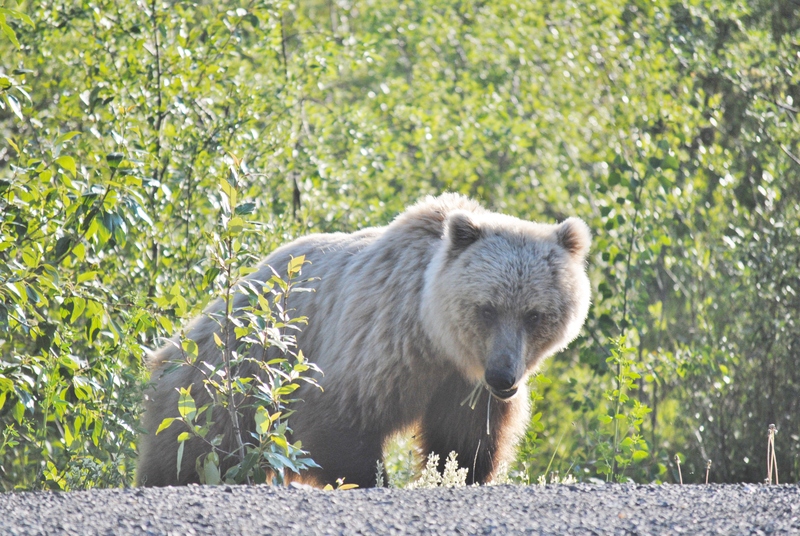 And even if you think the road is scary, like the one at Glacier Park, take it anyway. You’ll thank me later. Summers in the north are short but mosquitoes make up for it in volume. The Anchorage newspaper had an article on the shortage of mosquito repellent while we were there. We went prepared with several cans of assorted spray. The lesson we took from our experience is that life is too short to mess around. Buy the most lethal spray you can and then get some of those incense style smoky things. Oh, and it helps if you are not blood type O, apparently this is their favorite. We learned that there are still many rural areas where there is no cell service…and we were there. We saw an accident site and guy using his satellite phone to call for rescue help. Kind of frightening to think of being in an accident and it taking, not minutes but maybe hours, for help to arrive. But, on the plus side, we saw fellow travelers stop to render aid when needed. Back to the cell phones. Bob’s Verizon phone worked where ever there was service available. Once we crossed the Canadian border he got a message that his phone calls would cost $1.85 per minute—yikes! Speaking of connectivity, when we saw lodging there was most often a sign for wi-fi. There were also signs at all the Tom Horton’s and McDonald’s advertising free internet service. My Boost aircard worked all the way to Seattle and after we reached Boise. It was not meant for the North Country. Still, we all learned we could survive off the grid without email, texting, facebook, etc. 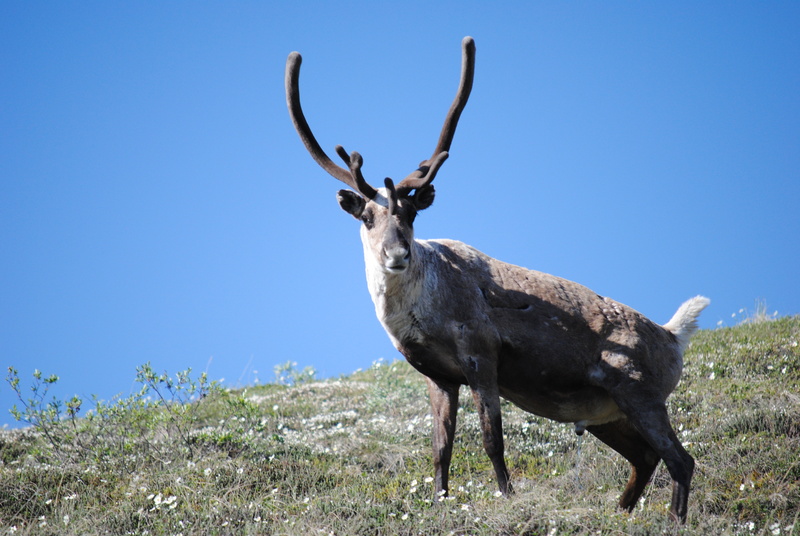 Oh, Rebecca learned that while reindeer and caribou are in the same family, they are not the same. No matter, Matthew thought they looked like Santa’s helpers. There were many, many miles where we had no radio service. I was outvoted on my plan to get a satellite radio so I could listen to Fox News. We had several mystery books on cds that were compelling listening and of course, we had Matthew’s very favorite Adventures in Odyssey which worked to calm him when he decided he’d had enough riding. Yes, there were times when Matthew held his head in his hands and cried because he was tired of traveling. Okay, so did the rest of us. It was a long trip. What I learned from this was there were times when we needed to stop driving and do something else…even if was just to jump out of the truck and swat at mosquitoes. And lastly, we learned that if you’re going on such a long adventure you really need to travel with people you like. Otherwise, it might be just a really long ride. Thanks for coming along with us. We loved all the comments and emails following the posts. We felt like we had a whole cloud filled with people riding along giving us incentive to share what we could see and do each day. This is the last day of my trip diary. In a few days I’ll post some observations, statistics, and other worthless nonsense. If you have a question you’re dying to know the answer that I haven’t covered, ask away. We’ll include it in the update. But let me tell you about today. This is the last leg of our trip. Had we a few more days we could have visited the reservation and a few other spots but today we’re ready to go home. Our first stop is a remote town on the Arizona Strip called Colorado City. Since you might not be familiar with this area I’ll share what little I know about it. Colorado City has made the news for years because many residents are members of a polygamist sect. For longer before that their remote location allowed residents to live as they wished with little government intervention. Polygamy was once approved by the Mormon Church but they ended the practice in the late 1800’s. 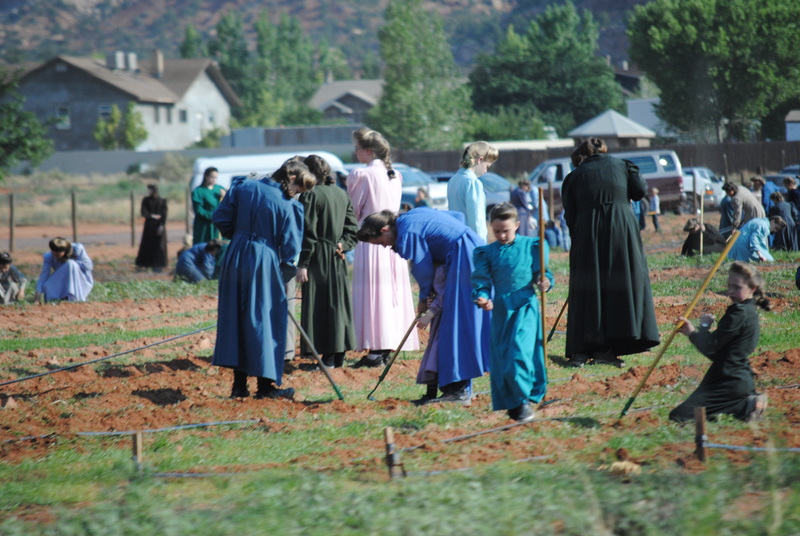 The FLDS is one sect, no longer associated with the church, who has continued this lifestyle. You can read much more about it in this 2011 news article from the Arizona Republic: Colorado City, Still an FLDS Stronghold. Our journey today took us directly through Colorado City and gave us a rare opportunity to catch a glimpse of these families. 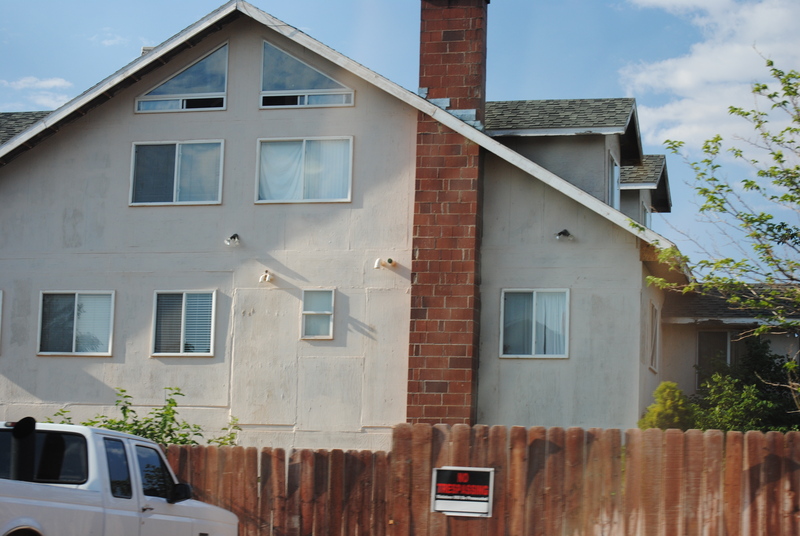 While we weren’t surprised to see the huge homes which would make sense in multi-wife and especially multi-children families we were surprised to see the high fences that kept out prying eyes of nosey people like us. We did see many residents…maybe one family??? working in the garden. We only saw women and children. Honestly, it was one of the most creepy areas we have ever traveled. I prayed that the truck would not break down and we decided that driving only one street was good enough for us. After having met and talked to so many independent women on our journey we would have liked to learn why/how these women could be so dependent on one man. In the end we were very glad that we drove through there but even more glad to leave. The drive from Jacob’s Lake to the 89, the north-south road to Flagstaff, took us down to the valley of the Colorado, and yet the river was in a gorge still several hundred feet lower. We continue to be awed at the power of nature and wonder at the relative insignificance of man. 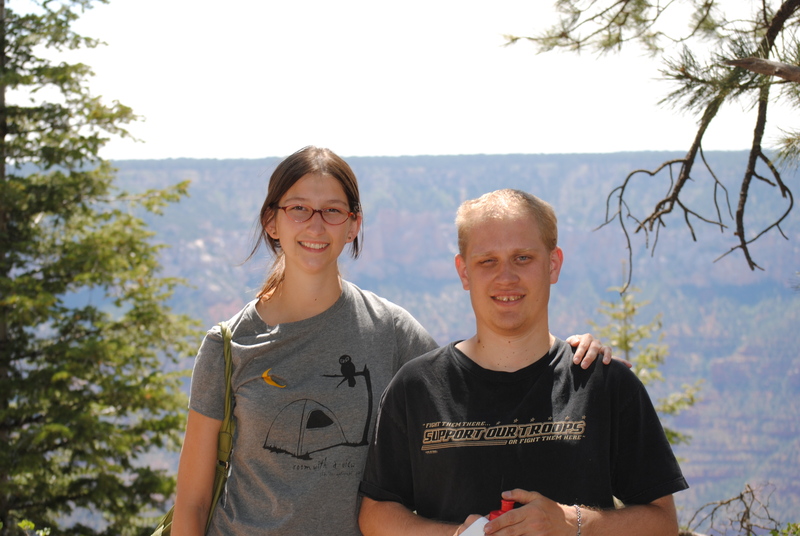 After driving through the western part of the Navajo Reservation we eventually made it to Flagstaff and yes, then our first freeway driving since we left Seattle. 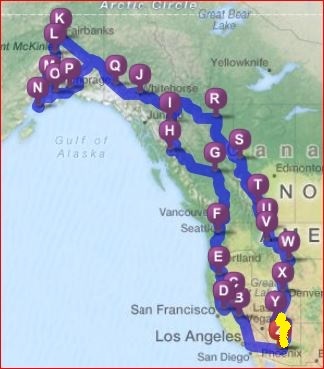 Finally, after more than one month on the road and a whole lot of miles we completed our journey. 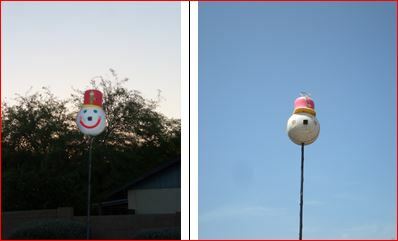 We discovered that it is still summer…and well over 100F though it is evening. The black cat (Spooky) won’t come near us but the yellow cat (Socks) has been crying since he realized it was us. Matthew is very happy to be home, back to his computer and his favorite TV shows and all his stuff (with the addition of his new Superman pal). So there you have it. Nine thousand nine hundred thirty three miles, through city and country, heat and cold, sun and rain we hope you enjoyed traveling with us. Tomorrow there will be wash to do, a truck to empty and a month’s worth of mail to review. But tonight we’re celebrating with our favorite Mexican dinner and an Alaska Ale. Cheers. Our first stop today was at a clothing store outlet where we often find things for Rebecca. We usually shop on line but since we were going so close Rebecca thought she deserved at least one shopping opportunity. We pulled up to the store three minutes before opening and found the door open so we walked on in. After a couple minutes the clerk showed up clearly startled that we were inside. I thought maybe we had the time wrong, but we didn’t. Rebecca did get to try on a few swimsuits and found one that she liked even though we never saw another clerk in the showroom…until we were ready to pay. Like many retailers today, they were very short on customer service. We wound our way down the old road until we reached Bryce National Park. Have you been there? It is such a unique place. I always think the colorful stone pillars left from eroding winds would be the perfect setting for a movie about the planet Vulcan. It is very alien. But beautiful. There are some good looking hiking trails down into the valley making yet another ideal place to come camp for a week and explore. Weathered rock in Bryce. What does it look like to you? Cathedrals, spires, an alien forest??? Not far down the road is another of Utah’s national parks, Zion. 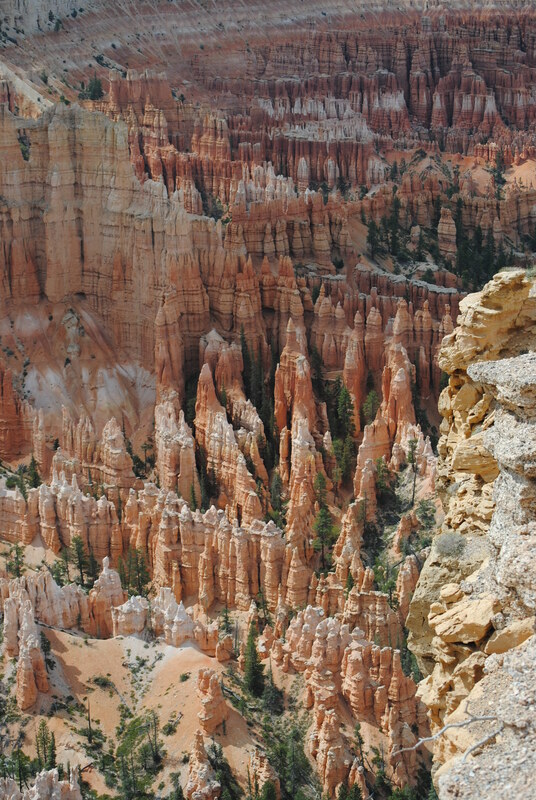 Crazy rock formations and strikingly beautiful…yet completely from Bryce. 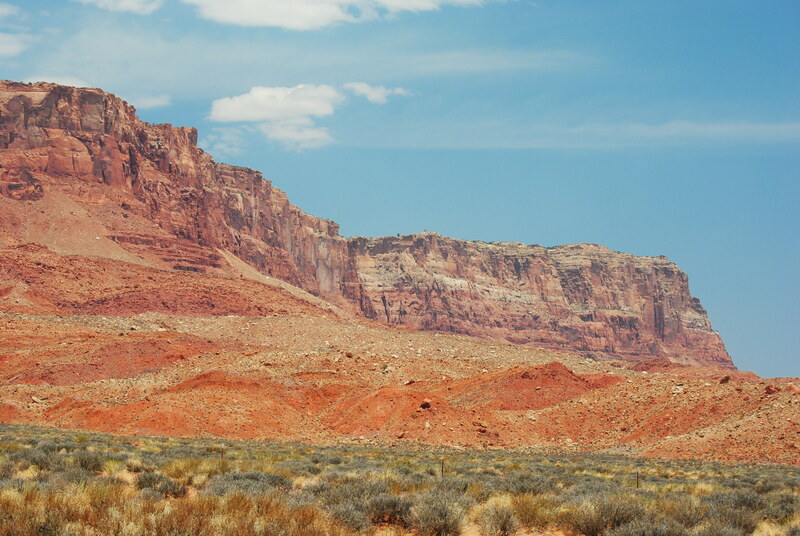 The park ends in the valley of the Virgin River and has a climate similar to Phoenix…that is to say, hot. There were signs all over warning people about the heat, telling them to take shade and drink lots of water so we figured there’d be plenty of camping spots open. We figured wrong and ended up in St. George. 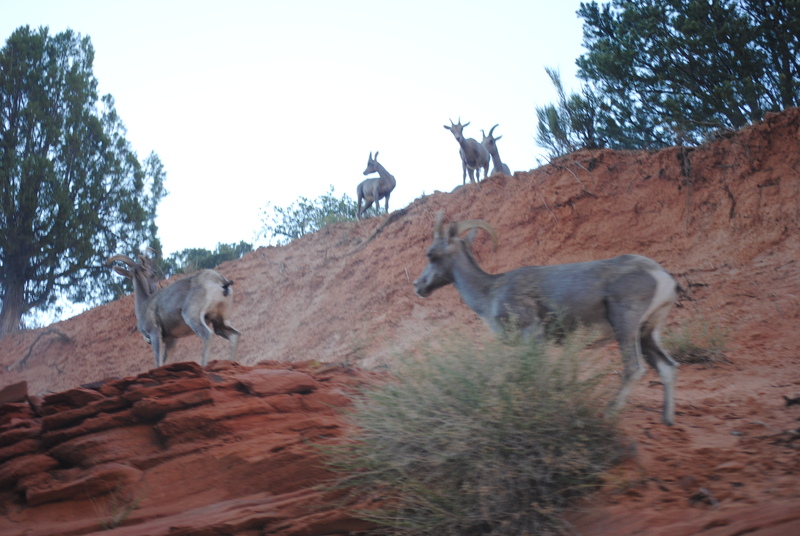 Sheep on the hill above us at Zion. Before I finish for tonight I have to tell you about Matthew. A while back I picked up one of the National Park travel books for him. I have seen them before but never thought he’d be interested then when we were at the museum in Whitehorse the guide gave him a similar travel book for the Yukon Territory. It looks like a passport and you can stamp it at key locations. Matthew found this to bea great treasure and kept getting it out to review. So when we saw them at Glacier Park I talked to the ranger about getting him one and she told me how popular these were with travelers and how fastidious some were about getting them stamped and buying the stickers, etc. I didn’t really think Matthew would care so much but expected he would like to look through it. Well, I was wrong. At each visitor center he leapt out of the truck, travel book in hand, ready to be stamped. 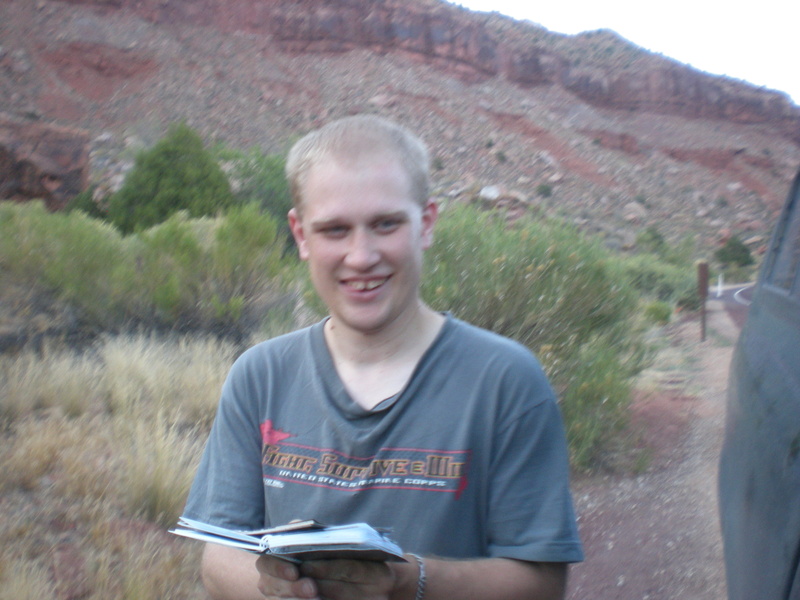 Just as he did when we got to the visitor’s center at Zion… five minutes after they closed. Truly a happy guy right here! Thus ending our day on a very good note. Tomorrow we are heading home. But…not without something exciting. If I could choose a second daughter it would be the vivacious, lovely and talented Sama Kamal. She is Rebecca’s roommate in medical school and we have so enjoyed getting to know her. We were excited when we learned that Sama would be in Salt Lake City this summer doing research and that we would be able to see her. Salt Lake is the end of another chapter on our journey. Our original plans called for Bob to fly back home from Calgary, Alberta but when he pouted so much about missing too many days of our adventure we figured out that if we stretched his vacation to end late Sunday we could actually come in to the States before he would need to return to work. SLC turned out to be the closest big city and so Bob’s end point. When you see the Mormon Tabernacle Choir they are sitting just in front of these huge pipes. 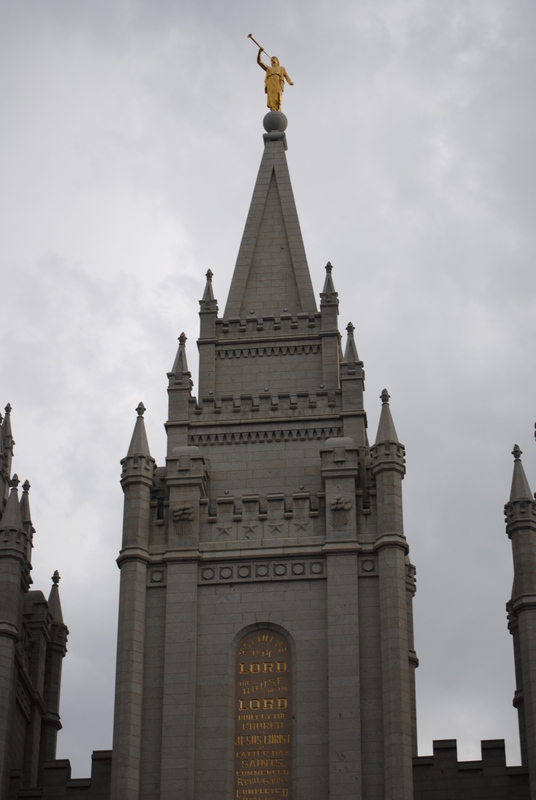 We were also very excited to learn that not only would we be able to visit inside the Tabernacle but that they were holding a Pops concert with the Utah National Guard band. I love pops concerts. So we ate dinner and then returned for the concert which was a combination of patriotic and popular US composers’ music. As you can imagine, Matthew was most excited when he heard the themes from both Star Wars and Superman. 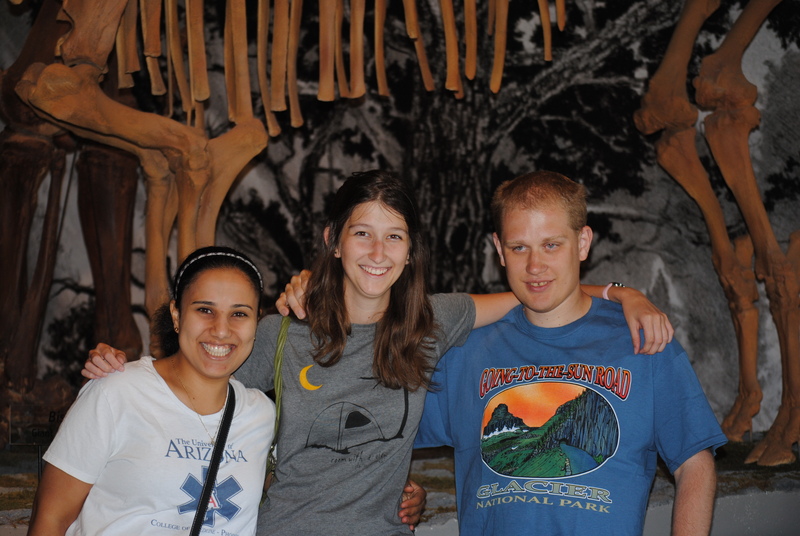 Today we picked up Sama and after breakfast visited the University of Utah’s Natural History Museum. It seemed like a pretty new museum and of course, Matthew’s favorite part was the gigantic dinosaur skeletons. (He loves dinosaurs but is always very sad because they are ‘dead’. I remind him that we would be scared if they were alive and chasing us but to no avail.) Anyway, after a fun filled day we took Sam back to her home away from home and then took Bob to the airport. It’s a lot quieter at the hotel room tonight. Tomorrow we are driving the scenic route to Bryce and Zion National Parks. Well, lucky for you today we’ll actually cover three days in one. And for good reason. 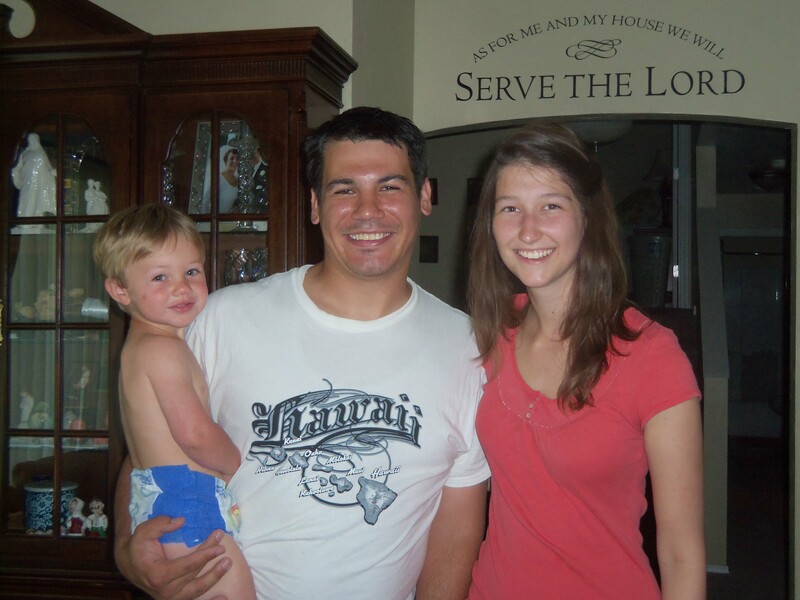 Mr. Chernich and his youngest with former student Rebecca. Our day began well. 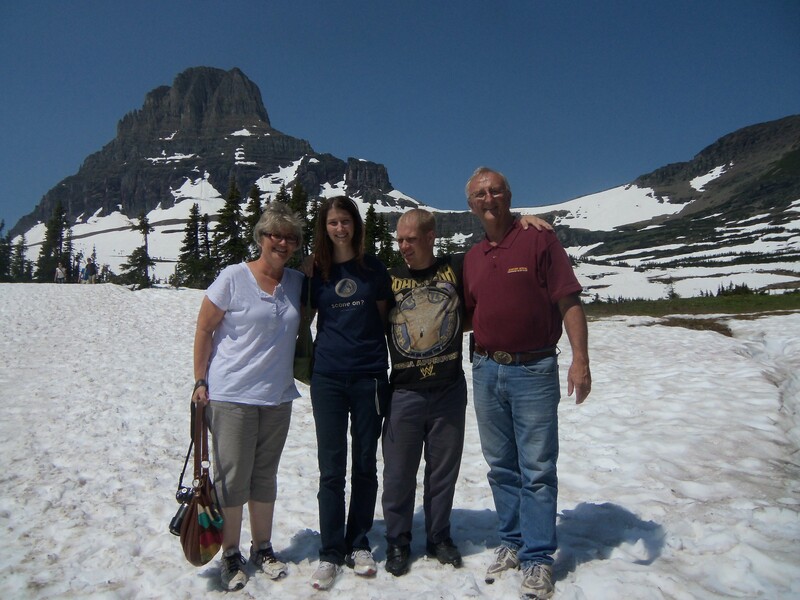 We visited Rebecca’s high school teacher, Mr. Chernich in Montana. 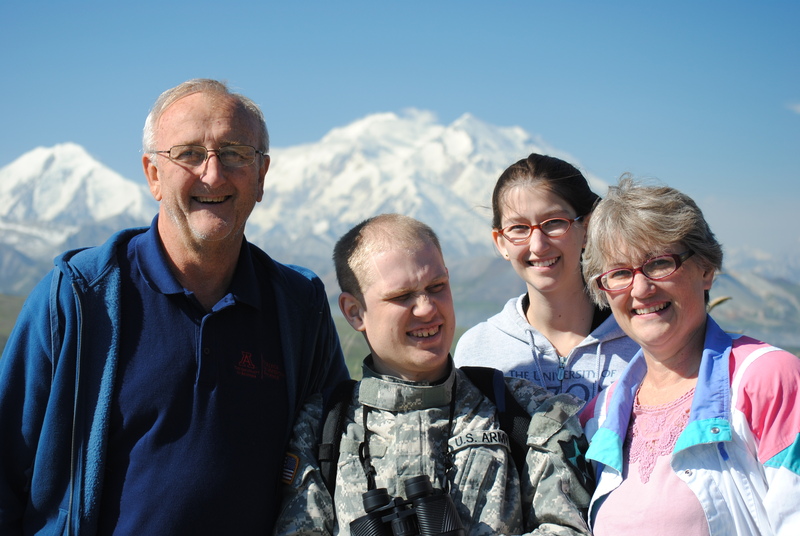 His wife is a primary care physician and the family is planning a major move to Fairbanks, Alaska. As you can imagine, we had much to talk about since we just came from that direction. It wasn’t until after we left headed for Yellowstone that the day went to pot. It began with a familiar sound: Eerrpppp… We’ve heard this many times before. Matthew was sick. He continued to be sick all the way to Yellowstone and by then Bob also was complaining he did not feel good. Two sick guys put a crimp on our plans to find a camp site as we decided the smart move would be to stay at the park’s edge in a hotel. 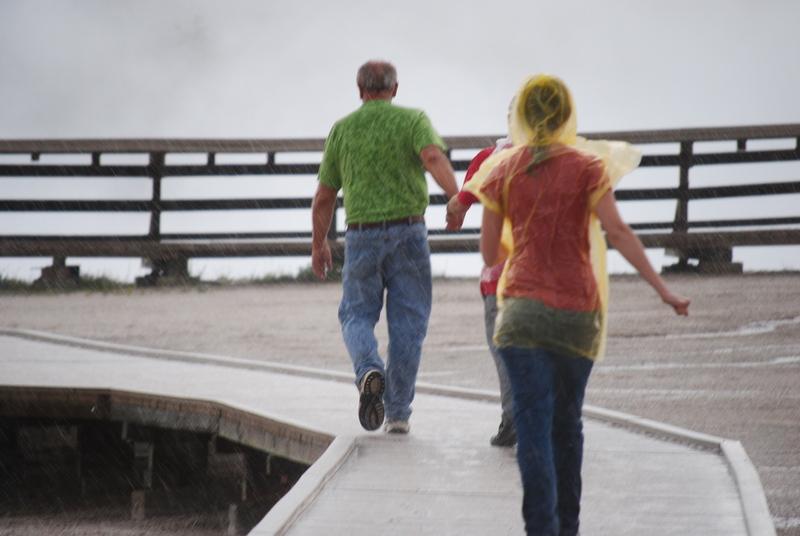 Fortunately, by morning both were somewhat better and we headed into Yellowstone. Unfortunately, everybody and his brother now had arrived in the park and all the campgrounds were full. Uh oh. 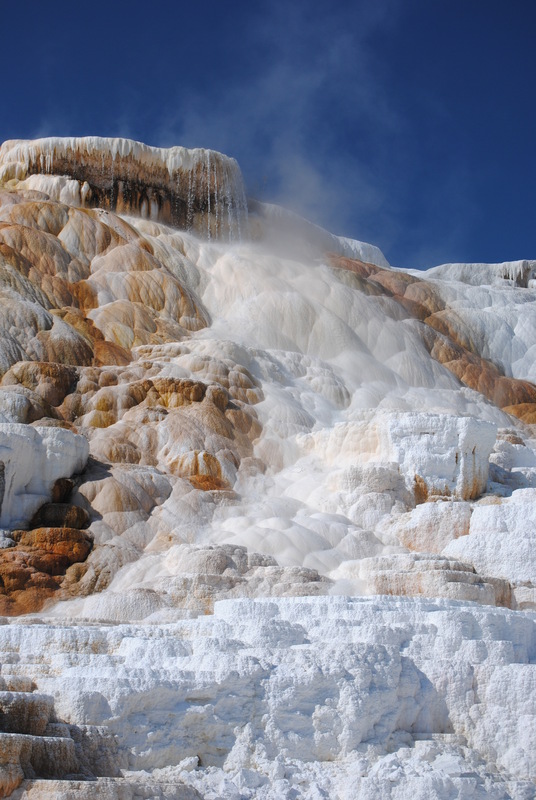 Yellowstone National Park is such a unique place. The geysers and paint pots impressed everyone and we loved the amazing blue and orange of the steaming pools that dotted the countryside. 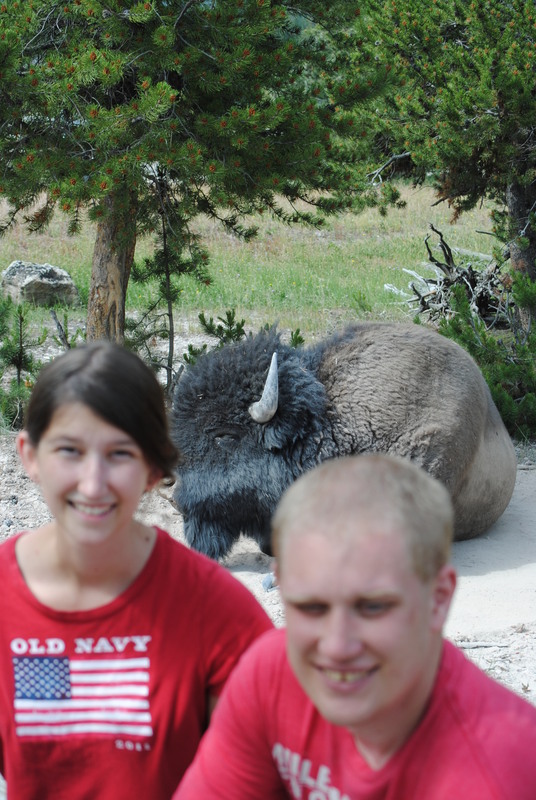 We saw lots of bison, including this one, who was just waiting for us to come by for pictures. We planned to stay in another hotel on the edge of the park but it appeared the sudden rain might have changed the plans of campers and by the time we left, all the hotels within 100 miles were filled. I tried to convince Bob that we could actually sleep in the truck but he was determined to find us a room. And good thing too. Just as we were checking in I realized I might not have escaped the germs and joined the ranks of the sick people. For a while Rebecca sat in smugness as she was sure her good hand washing technique had saved her. But it didn’t. 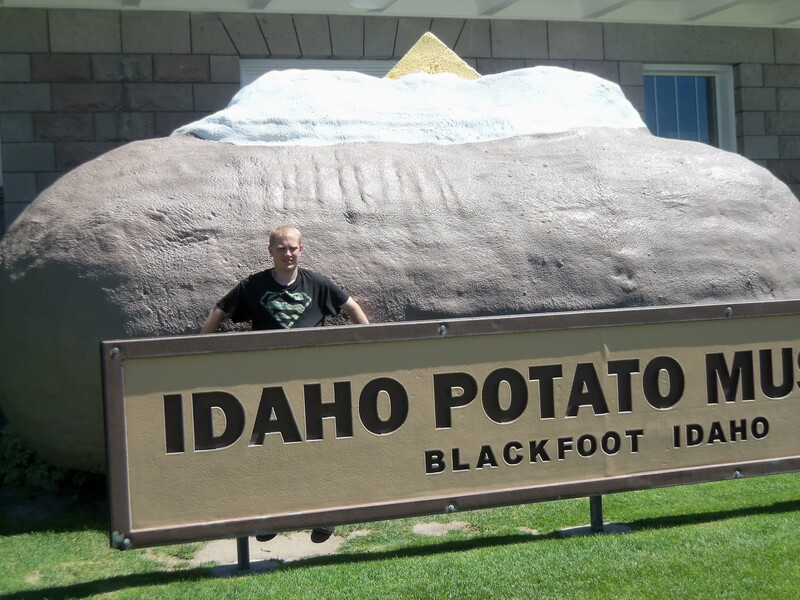 So we spent two days in Blackfoot, Idaho. Rebecca and I felt sorry for ourselves and slept while Bob and Matthew discovered this town had a potato museum. There you have it. Three days, two of which didn’t amount to a hill of beans. But tomorrow we are on our way into the beautiful Salt Lake City and will spend a day with Rebecca’s roommate. Okay, I’m going to chalk this overreaction up to being tired. Today’s drive up the “Going to the Sun Road” was the most stressful thing I have ever done. I tried, no, I begged Bob to turn around or at least slow down to 10 mph but he said he didn’t want to hold up all the traffic. So he said. It started out so simple. A drive through the forest to a glacier. Up the mountain and down the other side, then back. Oh, had I only known. The forest with just glimpses of the mountain peaks was deceptive. Just as the road breached the tree I spotted what appeared to be little more than a cow trail, chiseled into the side of the mountain. The road narrowed, though still supposedly wide enough for two mini cars to pass continuing to climb upward, ever upward. As passenger I was sitting on the part of the truck that surely overhung the pavement with only two of our ten-ply tires holding onto the road. The drop was sheer, surely thousands of feet, even miles down to the valley. It’s a gradual climb and you don’t realize how high it is until you are above the trees. On second thought…an overreaction? I think not. Even Matthew, sitting in relative safety behind driver Dad, was in fear of his life. We made it. Eventually, Bob was able to pry my fingers from the death grip I held on his arm. We saw the glacier at the top of the mountain. We experienced the alpine climate. And we headed back down. The other side, of course, and then around the base of the mountain, since there was no way in H E double-toothpicks I was going back. 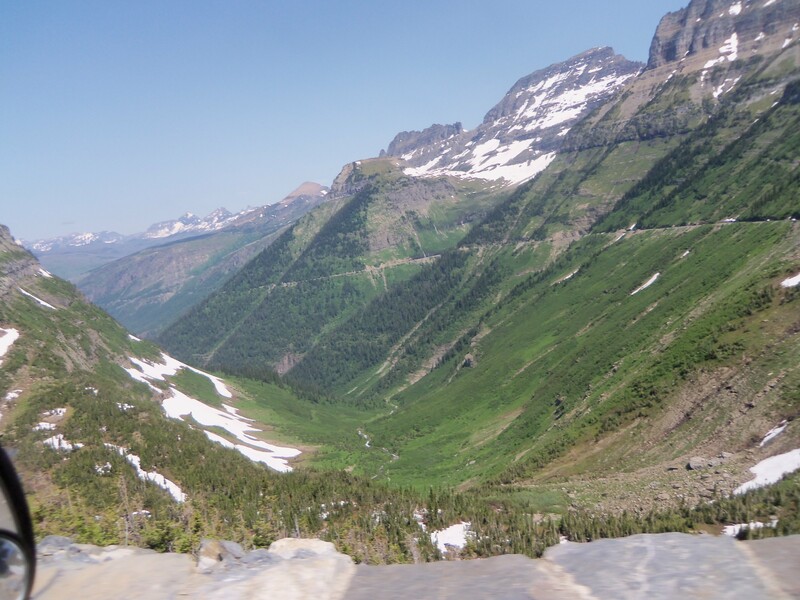 Yes, I can now cross Glacier National Park off my ‘to do’ list. 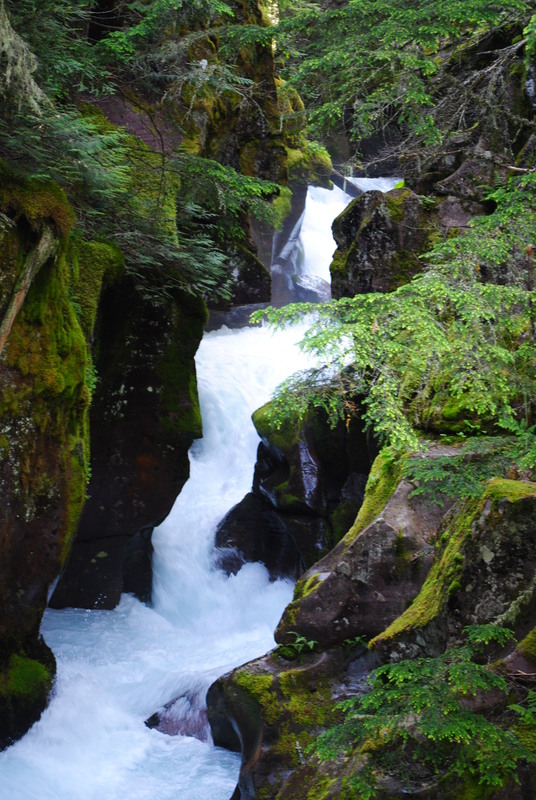 It’s pretty, green, has beautiful waterfalls that splash down on the road. You should go visit. My memories will last a lifetime. Oh, and have some huckleberry ice cream when you get back to the safety of the valley. 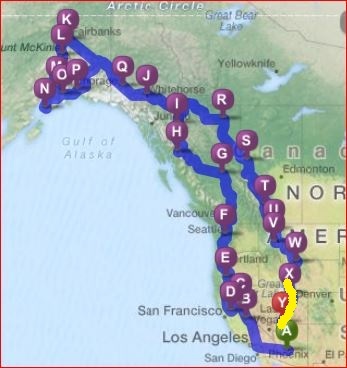 Tomorrow morning we are going to visit one of Rebecca’s high school teachers who now lives near Missoula so we continued south to the big city (I jest, but this is the biggest city we have been in for more than three weeks). Bob wimped out on staying at the Jellystone Campground with Yogi Bear. He said it was too hot. So, with a sad Matthew, we found a motel for the night. The sun peaked through and shone on one of the mountains just visible between the tall pines this morning. This would be a great campsite to stay a week and just relax. We used our new Thermacell on the mosquitoes but they really weren’t too bad. I think we have moved south of those pests. Will count my bug bites and confirm later. 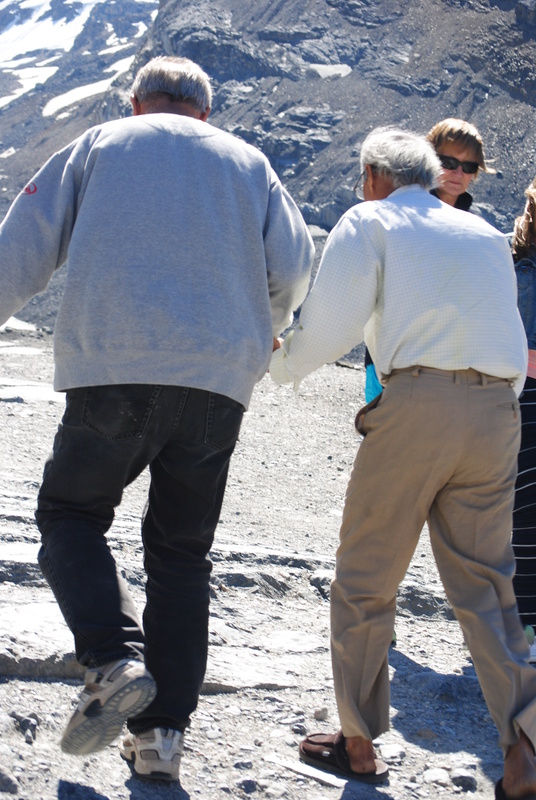 Here’s a shot of Bob helping an older man up to the glacier. He might not have needed help had he worn real shoes. 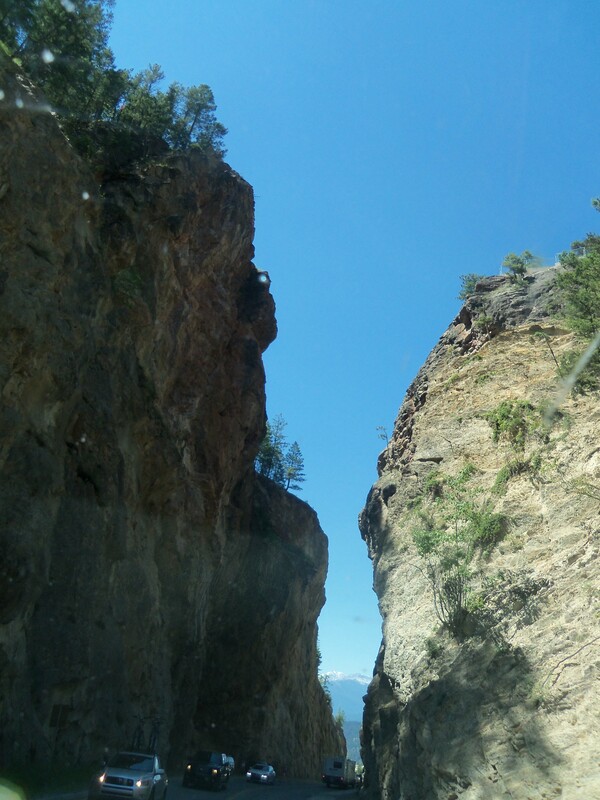 The drive into Radium Hot Springs follows the river downstream until we drove between a narrow cut groove in the mountain and emerged on the other side. The hot springs was on our ‘maybe visit’ list and since we ended up on the west side of the Canadian Rockies we were able to head south through this little town. We took advantage again of the hot springs and decided that a ‘hot springs’ tour across the continent would be pretty fun. This hot springs was set up more like a public pool with warm water and it was not as hot as I expected. 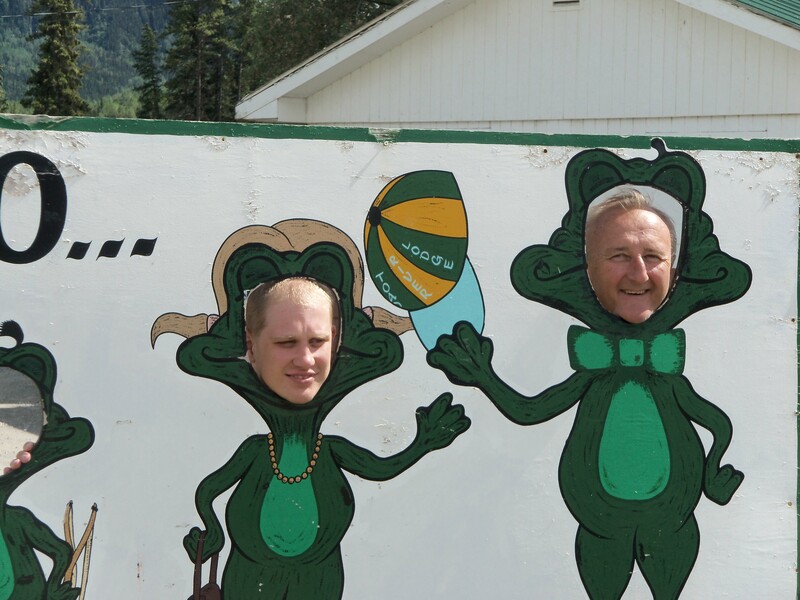 We decided we liked the more natural setting of Liard better. 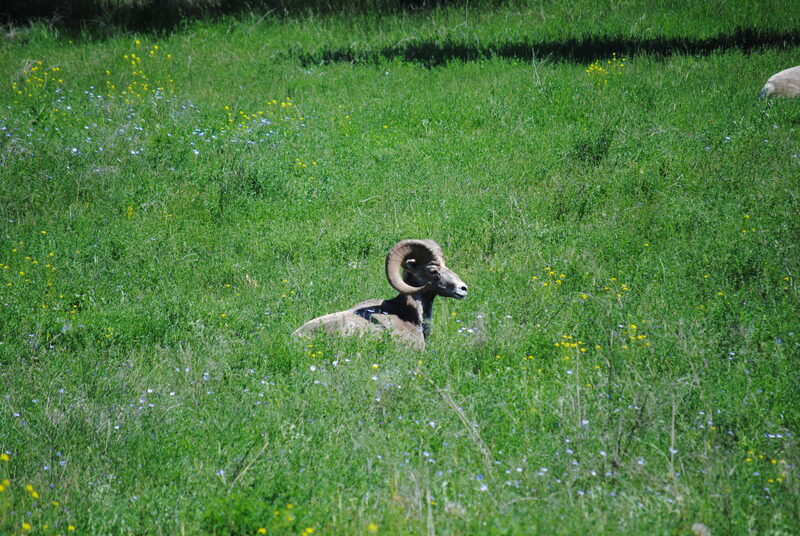 The town of Radium is known for its resident Dall Sheep herd so we were really looking forward to seeing the sheep wander through town. I was disappointed to read at the visitor center the sheep only hung out in Radium during fall and winter so we decided to head onward without searching them out. However, before leaving town, Bob discovered a do-it-yourself carwash and had decided earlier that the radiator screen thing was plugged with bugs, so we stopped there first. Good thing, too, because just as we pulled out we discovered the whole herd of sheep just sitting in the shade waiting for us. Another great photo op scored! Just sitting there waiting for us. 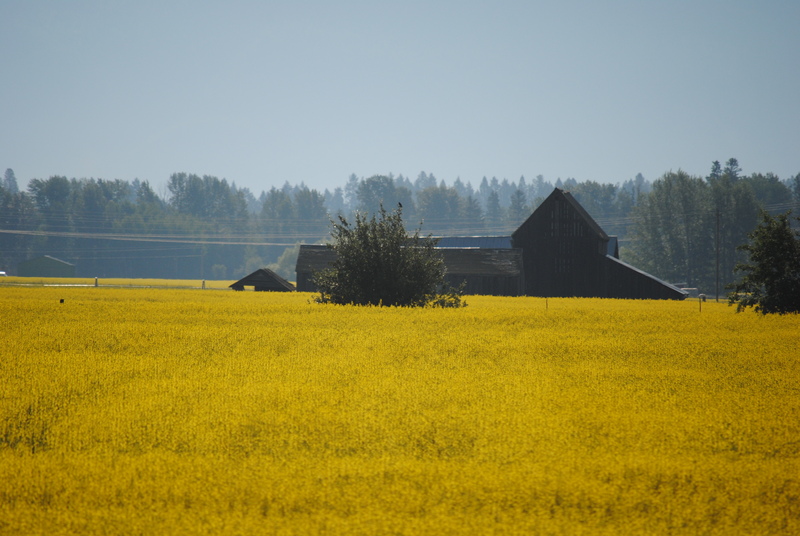 Field of something yellow in Montana. We are near our next stop of Glacier National Park. The darn GPS stopped working completely today. I guess I won’t be selling it to anyone except maybe for scrap metal. Do we need to buy a new one tomorrow or can we get by with our maps? I’ll let you know how lost we get.